The Twin Stim by Koalaty. Our most popular digital electrotherapy unit. 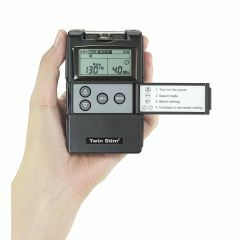 The Twin Stim 2nd edition is an exact combination of our TENS 7000 and EMS 7500, which gives the user the choice of 5 modes of TENS and 2 Modes of EMS. This is the unit that the consumer will buy if given the choice! Twin Stim's features include, Dual Channel, 7 modes, Timer, Patient Compliance Meter, New Stronger 100mA output, safety amplitude cover, sturdy metal belt clip, rubber side railings for maximum handling. Constant stimulation based on setting value. Only pulse width, pulse rate and timer are adjustable in this mode. "Constant" is equal to the "Normal" mode of a TENS unit. Alternate: The stimulation of the CH2 will occur after the 1st contraction of CH1 is completed. In this mode, the setting of ON Time should be no less than two times of the "Ramp" time. The OFF Time should be equal or more than the ON Time. ON TIME Ramp up + Ramp down OFF TIME ON. Modulation mode is a combination of pulse rate and pulse width modulation. The pulse rate and width are automatically varied in a cycle pattern. The pulse width is decreased by 50% from its original setting in 0.5 second, then the pulse rate is decreased by 50% from its original setting in 0.5 second. Total cycle time is 1 second. In this mode, pulse rate(2-150Hz) and pulse width(50-300S) are fully adjustable. The SD1(Strength-Duration) mode consists of automatic modulation intensity and pulse width in 40% range. The intensity is always increasing while the pulse width is decreasing and vice-versa. The intensity is decreased by 40% while the pulse width is increased by 40% in 5 seconds. In the next 5 seconds, the intensity is increased by 40% while the pulse width is decreased by 40%. Total cycle time is 10 seconds. Pulse rate(from 2~150Hz) and pulse width (from 50~300S) are fully adjustable. The SD2(Strength-Duration) mode consists of automatic modulation intensity and pulse width in 70% range. The intensity is always increasing while the pulse width is decreasing and vice-versa. The intensity is decreased by 70% while the pulse width is increased by 70% in 5 seconds. In the next 5 seconds, the intensity is increased by 70% while the pulse width is decreased by 70%. Total cycle time is 10 seconds. Pulse rate(from 2~150Hz) and pulse width (from 50~300S) are fully adjustable. Timer: Adjustable, from 5 to 60 minutes or Continuous. Adjustable in 5 minutes each step. Treatment time countdown automatically. System Includes: Stimulator, Lead Wires, 1 package of high quality Self-Adhesive Electrodes, 9V Battery, Hard Plastic Carrying Case, Instruction Booklet. Lightweight. Sturdy. Easy Storage. Effective. Best little TENS/EMS combo out there. Highly effective, offers fantastic range of settings, lightweight yet sturdy, and priced perfectly. Private Practice PT. Physical Therapist. I'm just opening my own physical therapy practice and with any new venture the budget is tight. This stim unit is everything I could possibly need for a more than reasonable price. I have very little space for storage and this does the trick on all fronts. I would definitely recommend this unit to others-why spend more money when you don't need to??! Average Health. dealing with knee problem. Have used Tens units for years...thought this sounded like a good combination. Have to get this programmed, but once it is done, should be great. Nice tens and ems unit. .
by dter100 from Seattle, Wa. The machine works very well with the different pads that are available from Allegro Medical. The mid-range price is great for our income. The machine has more power than some of the other machines on site. Works very well at relieving her spasms. Can it help to reduce joint swelling? Asked on May 10, 2011 8:05:25 PM by Jim from Roanoke,VA. Do they have an AC adapter for this model? Specifically one made by the manufacturer that will not void the warranty! and also where is the best deal on 2" by 2"